This style sterling silver Name Necklace is made as a smaller pendant than our regular Name Necklaces - perfect for the dear little girls in our lives, but also suitable for adults too. The font style is called "Angel". 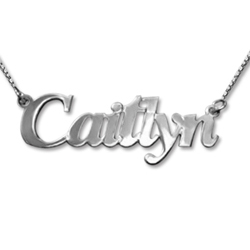 Please Note: The turn-around time for your personalised, custom Name Necklace is 2-3 weeks. We regret we are unable to process urgent Name Necklace orders any faster than this.